For the Sonic Drift 2 level, see Casino Night (Sonic Drift 2). 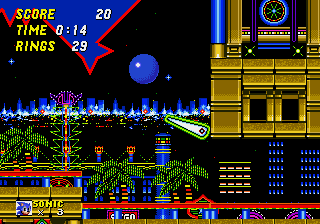 The fourth zone in Sonic 2, Casino Night Zone fills the Casino theme requirement for the second Sonic game. A city that never sleeps, Casino Night Zone is full of pinball rooms, flashing lights, and slot machines. The player must beware of the slot machines, because getting three Dr. Robotniks releases 100 of the player's rings. On the other hand, if the player is lucky enough, they can get up to 999 rings (see picture on the right). Casino Night Zone had one of the most drastic art changes between the Simon Wai prototype and the final, changing from a pink card-suit-based scheme to a golden area. The Casino Night Zone makes appearances in two episodes of Adventures of Sonic the Hedgehog: "High Stakes Sonic" and "Mobius 5000". It also makes an appearance in issue #1 of the Sonic the Hedgehog comic. Casino Street Zone from Sonic the Hedgehog 4 Episode I shares traits with this zone (including the badnik "Crawl"), but was not inspired by Casino Night Zone, as stated by Ken Balough. This stage marks its return as a bonus DLC pinball mini-game stage for those who preordered Sonic Generations for Xbox 360 and Sony PlayStation 3, and as a full complete stage in the 3DS version. Crawl - Crab enemy, protects itself with a shield, so it can only be destroyed from behind. This page was last edited on 8 April 2018, at 10:12.